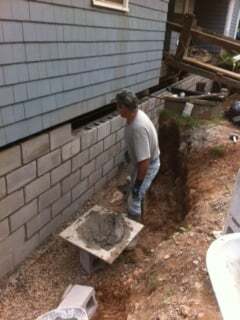 Foundation Repairs: A number of things can go wrong with foundations when drainage isn't working properly or moisture barriers are no longer effective. Original soil type plays a role also in drainage. Although sandy soil allows for drainage it is not a substitute for leaving drainage tile out all the time. Building on an elevated site may offer good runoff for groundwater but springtime water tables when suddenly increased in the sping can be problemattic.Water will allways flow faster through an empty drain tile before it will drain through sand. In all cases doing everything possible to drain water away from buildings is preferred,that way buildings are only expected to deal with minimal saturation times. Standing water next to buildings also encourages moisquito growth at unwanted times throughout the year. Drainage pipe and often ditching are both good deturant to the freeze thaw climate we see throught our Nova scotia winters.